Before you get into the pool, check your AquaJogger® to ensure that it’s properly positioned, fits snugly, and has all of the slack out of the belt. Get into the pool and hold onto the side while you move your legs directly underneath you. Push away from the side of the pool and check the level of the water. You have the right amount of buoyancy when your head is comfortably out of the water as you gently tread water. A tether line such as the AquaHitch® can assist you in maintaining correct body position in the pool and/or minimizing your traveling forward in a confined area. 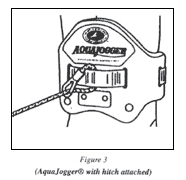 You can attach one end through the AquaJogger® belt as shown in (figure 3) and the other to a pool ladder, a lane line, a heavy object or some other stationary object at pool side. Brennan likes to use two AquaHitches® threaded through the large port-holes in the back of the AquaJogger® to increase lateral stability. Before and after each workout session, warm up and cool down for 4-5 minutes with some very light activity followed by some gentle stretching. Keep all movements smooth and stay relaxed. Take your pulse periodically during the workout and try to use the RPE scale to monitor your intensity (figure 4). “Deep water” is water sufficiently deep that your feet do not touch the bottom of the pool when suspended in an erect position by an AquaJogger®. “Shallow water” refers to a water depth that ranges from your waist up to your shoulders, giving you the option of touching the bottom of the pool at any time. An AquaJogger® can be used effectively to perform a variety of “buoyancy assisted” or suspended exercises in shallow water. It is important that you master the correct running form before starting your conditioning program. It can be helpful to have someone stand at pool side and read the instructions in the Running Form section and provide feedback on how you are progressing. If this is not possible, memorize the running form section and coach yourself through the basics. Start slow and easy and check out your form. Increase your speed slightly and check yourself out at this faster cadence. Gradually pick up the tempo, a little at a time, and check your form before you shift into a higher gear. Continue until you reach an all out effort without losing form. When you master this level, you are ready to start your training program. The magic of water allows you to progressively add more weight or load to the body. By varying the depth of the water, you’re varying the load or the impact that you place on your body. As you progress downward to shallower and shallower water, you increase the load on the body. Using variable depths is very useful when recovering from an injury or when you’ve had a hard training session and you need to partially unload the body. Training at variable depths can often help prevent injuries and is an excellent cross-training procedure. In a pool in which you have to share space, stake out your own turf by moving forward in a series of straight lines and quarter turns that make a nice little square. First, move out away from the pool side in a straight line, maintaining good form. Remember, most of your effort should be spent turning the legs and arms over and not moving forward. When you get to the first corner of your square, take a quarter turn to the right and keep moving in a straight line. At the second corner of the square, take another quarter turn to the right and proceed forward while focusing on a point at the side of the pool directly in front of you. This will help you maintain a front to back action moving all the joints in a straight line. At the third corner of the square, take another right turn and proceed straight ahead until you reach the starting point. You have completed one lap of the track and staked out your training area. For variety, try traveling in different directions or using a rectangular shape if you have room.